Any dog breed that is a cross between a pure bred poodle and another breed is known as a Poodle Hybrid. The Aussie Doodle is a Poodle Hybrid between a Purebred Poodle and an Australian Shepherd. This breed of dog falls in a category of dogs known as "designer dogs". The Aussie Doodle is a popular companion dog, it is also known to be used for herding purposes as a farm dog. 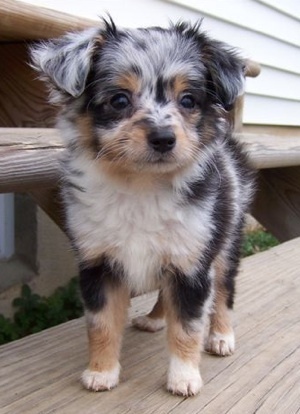 This breed has the temperament of both a poodle and and Australian Shepherd since it has both their qualities. Aussie Doodle are a lovable breed and get along with dogs and other pets around the house. They are also known to be friendly and patient with small children. This breed is not considered good as a watch dog because they are quite friendly in nature and get along with anyone. The Aussie Doodle are prone to some common health issues, these include PRA and hip, elbow or patella dysplasia. Another major problem with this breed is that they react severely to a commonly used medication for heart worm disease, Ivermectin.